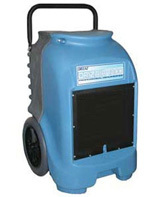 The Dri Eaz DrizAir 1200 Dehumidifier is simple to use, portable and manoeuvrable and ideal for use in small to medium sized areas for restoration, drying and domestic dehumidification in severe conditions. The unit is tough and reliable, easily operated by one person and ideal for carriage from site to site in even the smallest transport vehicle. Dri Eaz has a reputation for high quality and this unit lives up to it. The Dri Eaz DrizAir 1200 dehumidifier is a heavy duty dehumidifier designed for the restoration specialist and optimized for operation in extreme conditions and demanding working environments. It incorporates robust components designed for long life and maximum performance, including a 6670 BTU rotary compressor and a superior high airflow filter. The unit is durable and encased in a rugged roto-molded housing which is tough enough to resist shocks and impacts, on the job or in transit, and is designed to allow stacking of multiple units in two layers. The integral handle of the unit is designed to give support and stability to another unit stacked above it. The polyethylene housing provides light weight and protects both the unit and any object it may make contact with, such as a customer's furnishings. The casing comes with a life-time guarantee which is evidence of the confidence Dri Eaz has in this component. The warranty for the unit as a whole includes one year parts and labor and six years on the compressor and coils. For convenience of operators and to facilitate the use of the unit in tight spaces the 1200 has been designed to be a compact dehumidifier. The external dimensions are only 20 x 19.5 x 32 inches and the integral handle and sturdy wheels, with semi-pneumatic, non-puncture tyres, make the unit easy to manoeuvre by one person on site. The unit's small size is also helpful in any situation where access is restricted or usable floor space limited. The DrizAir 1200 is easily portable. With a small profile and manageable weight (80lb) it may be carried easily in almost any vehicle and can be quickly transferred from one location to another. The unit has an impressive performance and will extract 64 pints of water at AHAM test conditions of 80°F and 60% relative humidity. In restoration work the conditions are often much more severe and the unit will extract more moisture, rising to a maximum of 132 pints per day at 90°F and 90% relative humidity. At the other end of the scale the 1200 has the capability for low temperature operation. The formation of ice on the coils is countered by a hot gas bypass defrosting system which enables the unit to operate effectively at temperatures as low as 33°F. This capability far exceeds that of most dehumidifiers designed for residential applications and will be attractive to some prospective users who have a particularly cold basement or other cool area of the home. The 1200 is configured for continuous drainage and incorporates a condensate pump which purges the condensate from an internal reservoir at intervals of six minutes. A 40 foot drain hose is supplied with the unit through which the water may be discharged to any convenient outlet. User reaction to the DrizAir 1200 has been very positive with particular reference made to its reliability, compared with other brands, and its low maintenance requirement, high performance, ease of use and on-site manoeuvrability.